With the unwitting assistance of that notable 19th-century hymn-writer, The Rev. William Henry Havergal, one-time Hon. 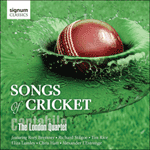 Canon of Worcester Cathedral, who was born at the time MCC first asserted their authority as custodians of the laws of the game, The London Quartet supply a helpful 21st-century addenda for the benefit of confused converts in unlikely territories. 3. These rules must be taken with | all due | seriousness: honour, gentility, | and a | pinch of | salt. 4. The first MCC tour took place to the United States of America in eighteen | fifty | nine: nevertheless, they are still hopeless at the sport, | Ha ha | Ha ha | ha. 5. France, despite being silver medal holders of the Olympic | cricket | title: have | little . to be | proud of | either. 6. No suggestions shall be heeded from America as to how to “liven | up the | game”: things perhaps have gone far enough already, we are now playing at night, to piped music, in pyjamas, with dancing girls, white balls, no, scrub that, pink balls; that reminds me, | must | go and | wash my | box. 8. In Europe, it is important that each side respect one a-|-nother’s | territory: occupation of the crease will not be achieved by the laying down of towels, even in the morning session, and remember to polish the | bat, not | bat the | Polish. 9. The cut will be the most effective stroke in the | Middle-| East: Nota bene – some of the English team | shall be | half-| cut. 10. If, at the behest of the captain, any player should bowl re-|-rea.ted | no balls: the umpires shall have the power to empty their | pockets. of their | bundles. of cash.